3. "Nuove informazioni sulla persecuzione e morte di Wilhelm Reich"
This is an Italian version of my essay "New Information on the Persecution and Death of Wilhelm Reich". PS to " In Case you Missed These Two New Books"
I neglected to include the following information in that prior announcement. Here are a couple of Preview PDFs of the new books, showing covers, Table of Contents and Index. The Hodann Preview also includes my "Introduction" section to that book. Please be aware, these books are already getting slandered on internet, and my "in box" has an uptick of nasty commentary from ignorant strangers, as well as compliments from those with a long history of support for Reich’s original orgonomy. 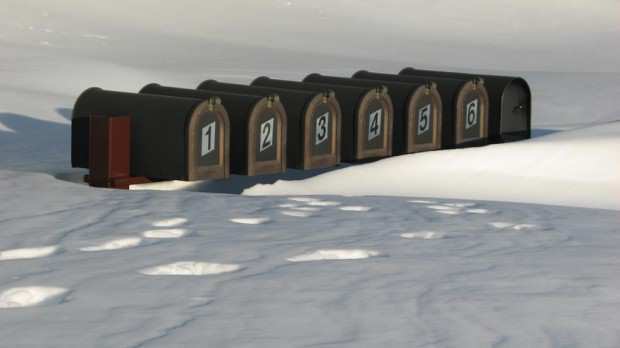 Those letters are a testament to the important materials contained in the books. Please help support orgonomic research by purchasing our new books on the subject, for yourself and for younger students. Dr. Wilhelm Reich is the man whom nearly everyone loves to hate. No other figure in 20th Century science and medicine could be named who has been so badly maligned in popular media, scientific and medical circles, nor so shabbily mistreated by power-drunk federal agencies and arrogant judges. Publicly denounced and slandered in both Europe and America by Nazis, Communists and psychoanalysts, placed on both Hitler’s and Stalin’s death lists but narrowly escaping to the USA, subjected to new public slanders and attacks by American journalists and psychiatrists who deliberately lied and provoked an "investigation" by the US Food and Drug Administration (FDA), imprisoned by American courts which ignored his legal writs and pleas about prosecutorial and FDA fraud, denied appeals all the way up to the US Supreme Court, which rubber-stamped the FDA’s demands for the banning and burning of his scientific books and research journals, and finally dying alone in prison — who was this man, Wilhelm Reich, and why today, some 50 years after his death, does he continue to stir up such emotional antipathy? It is a literal 80-Years’ War of continuing misrepresentation, slander and defamation. Who were and are Reich’s attackers? And what stands behind their obsession to utterly rid the world of him, and of his work? What are the facts regarding Reich’s social-sexual theories and his experimental work on the orgone energy, or life-energy? 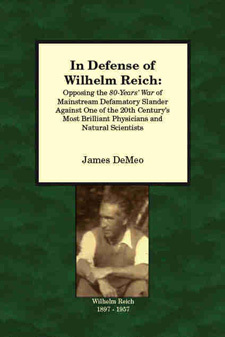 Author and Natural Scientist James DeMeo takes on the book-burners, exposing with clarity and documentation their many slanderous fabrications, half-truths and lies of omission. In so doing, he also summarizes the lesser-known facts about Reich’s important clinical and life-energetic experimental findings, now verified by scientists and physicians worldwide, and holding great promise for the future. With numerous illustrations, citations and index. Or from Amazon, Barnes & Nobel, and other on-line or street stores in the USA or Europe. International: Your shipping charges will be indicated to you after your order is entered. Your card will not be charged until you approve shipping charges. Payment by Visa, Mastercard, or PayPal. By Max Hodann, MD, a Central Participant in the European Weimar-Era Sexual Reform Movement. With a new Introduction by James DeMeo, PhD. European Emperors, Kings, Kaisers and Tsars, and their Churches, forbade contraception, women’s equality and divorce. Baptismal Certificates and class barriers dictated who could legally marry, attend school or the university, advance socially, and who could not. World War I finally swept them from power, but their dictates frequently remained as law, in a turbulent era of struggle for freedom and democracy, versus resurgent fascism and slavery. Hodann’s History contains a clear discussion of these historical developments within the sexual reform and women’s rights movements of Weimar Germany and Europe generally, in the early decades of the 1900s. The parallel advance of scientific knowledge on human sexuality is also detailed. 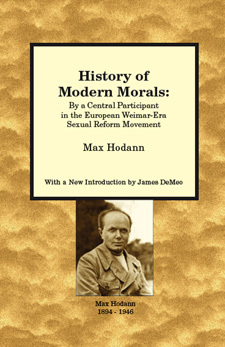 Unlike many contemporary works on these subjects, History of Modern Morals is authored by a physician who lived the struggle, was a leader in it, got arrested by the Nazis for it, and intimately worked with other professionals who also had personally suffered for their work in the same social-sexual reform movement. His writings are therefore filled with a strong passion and vitality, and with many personal observations, anecdotes, and clarifying information not found elsewhere. Hodann’s History is also unique in that he frequently and positively discusses the work of his contemporary and associate, Wilhelm Reich. This is especially important given their life-positive emphasis upon love and emotion in sexuality, and their distinction between natural-healthy heterosexual genitality versus neurotic and unhealthy sexual expressions. In the modern era of "politically correct" moral equivalence, this essential distinction has been diminished or erased from public discussion. The new Introduction by DeMeo provides historical context for the Weimar years and Reich’s relation to Hodann, as well as lesser-known aspects of the Marxist political parties which ultimately betrayed the larger SexPol and other social reform movements. Fully indexed. International: Your shipping charges will be computed only after your on-line order is completed, after which we will inform you of the shipping prices and options. Your card will not be charged until you approve the shipping charges. If you ever needed to fully grasp what incredible liars are the dominant left-wing media — newspapers, TV, cable, etc. — then just consider this event which happened last week, and which probably only 5% of the people getting this email will even know about. Of course part of the reason you probably did not hear of this, is because this fierce winter storm came so early in the season, breaking many cold-snow records, and because it arrived so quickly on the heels of the last IPCC report beating the "global warming" drum. We get this kind of snow at our Greensprings Center nearly every winter, but we are above 4000′ elevation and the accumulations don’t get so great until around February. That this happened in just one big winter storm that hit so early in the year, agrees with the minority view that a serious cool-wet trend is in the making. Go back 50 years ago, and this sort of thing was fairly common. Stock up and plan accordingly. And consider to cancel your lying newspaper subscription, and start supporting news media where they don’t routinely censor out or slander scientific dissenters? But by gosh, some "journalists" are on the job! We can get accurate news from …. INDIA! All the hysterical doomsday predictions of the "warmers" have gone down the toilet… even as their unethical or criminal lying and data fudging becomes more clearly documented.